Mamak hasn't been open long in Melbourne and already it's hit Number 3 on the Talk of the Town Urbanspoon list. That has gotta say something about it's popularity. MerlinFan and I headed down for lunch today, and despite it being almost 1.30pm, the place was packed. There was ample space though, and we were seated immediately. 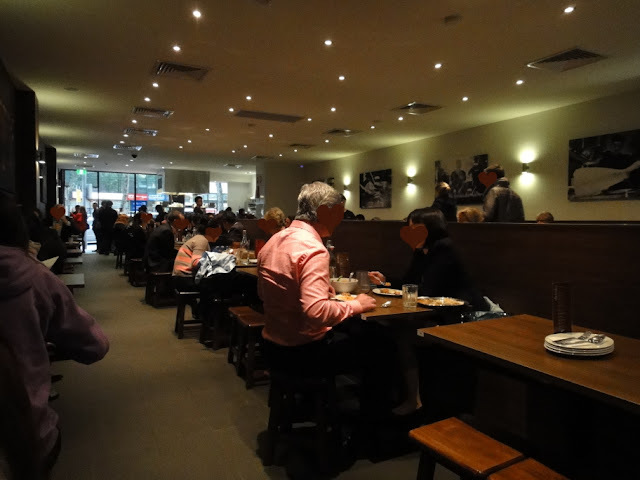 The atmosphere was roomy and comfortable, with wooden stools and long cushioned benches. It was deafeningly loud, reminiscent of a school canteen despite being seated at the very corner of the room. 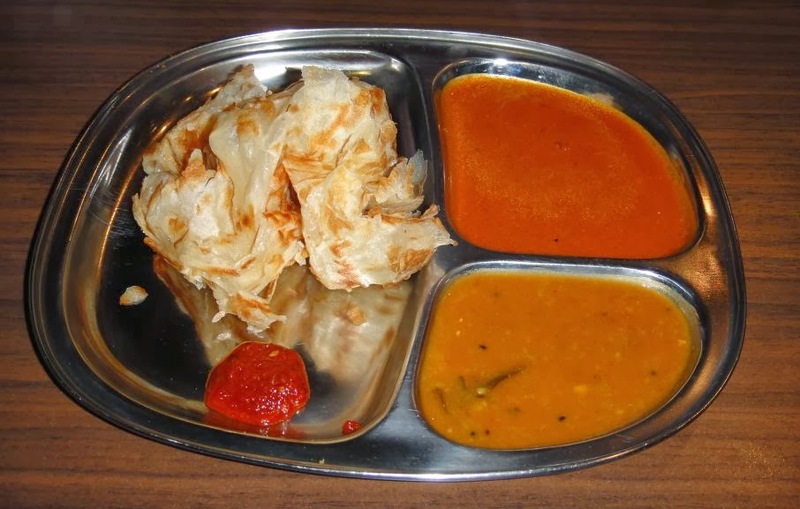 Mamak, as it's name suggests, offers all kinds of Malaysian hawker or street food including rotis (bread), satay, rice and noodle dishes. It was pretty busy, and it took a little while for the waitress to come and take our orders. It was another long while more before our food arrived, and when it did, my food arrived before our drinks. 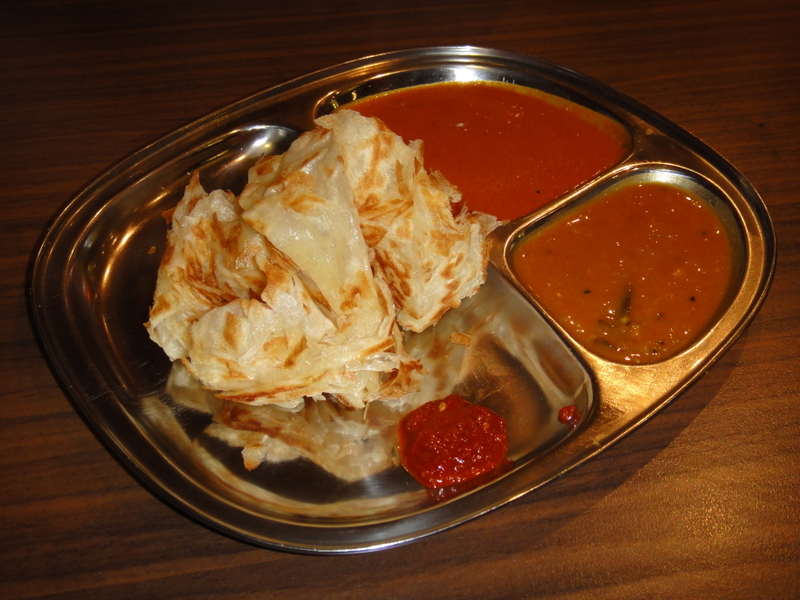 I had the Roti Canai, which was their original roti, served with two curry dips (one with dhal) and a spicy sambal sauce. 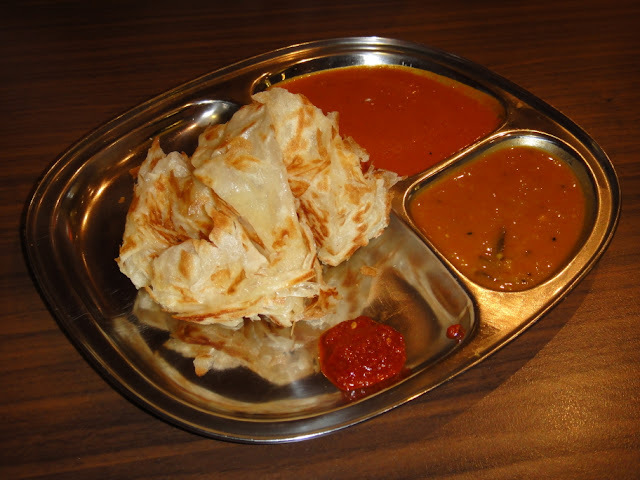 The roti canai was crispy on the outside and fluffy on the inside with a satisfying chew and slight sweetness. The curry dips were delicious with different heat intensities. 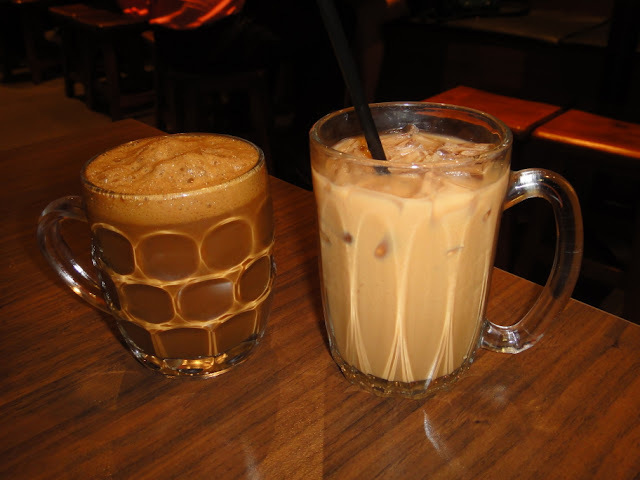 Our drinks came as we were halfway through the roti canai. MerlinFan's Murtabak came next. You can choose to have it with chicken or lamb - MerlinFan chose lamb. 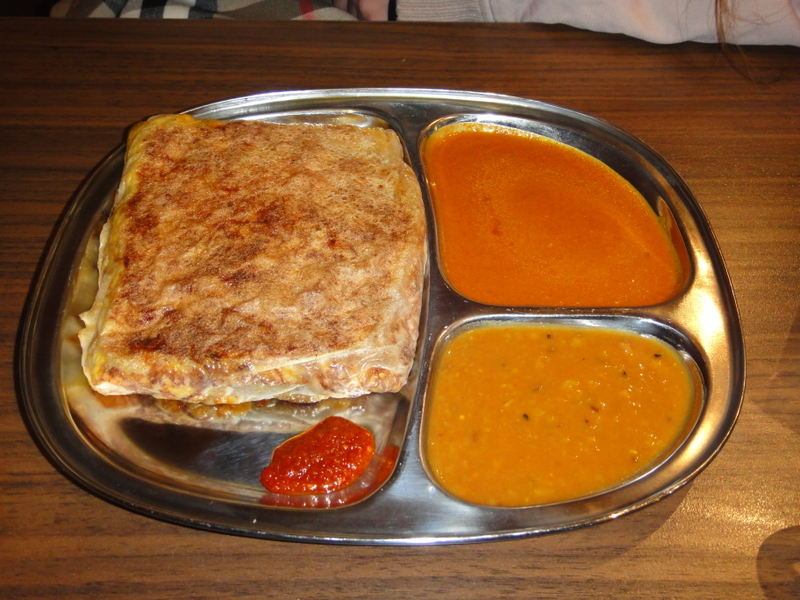 For the murtabak you have to allow 15 minutes of preparation time. 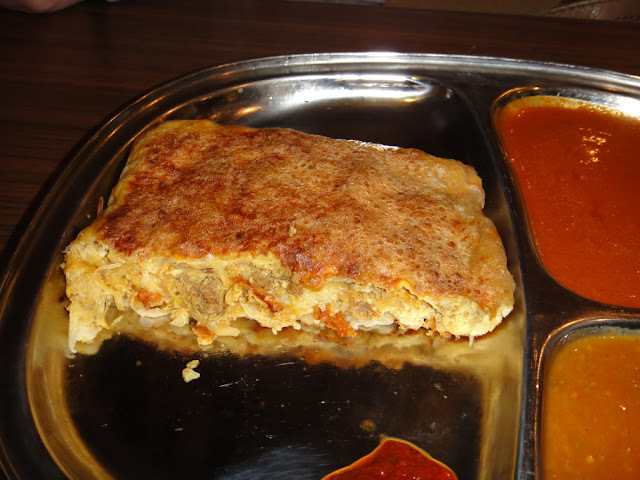 The murtabak is basically a stuffed multi-layered pancake or bread - ours was filled with meat, cabbage, eggs and onion and also came with the same curry dips and sambal. It was rather heavy and more filling than it looked with soft lamb mince inside. MerlinFan enjoyed it. We were pretty full after the murtabak but we couldn't leave without dessert. After the spiciness of the curry dips and the burning hot murtabak filling, plus my hot kopi tarik (suuuuch a big mistake!) I was dying for something icy. We were sitting right in the corner of the room and I had to flag down a waitress to take our dessert order. She told us to wait and she would return but she never did >:( After a while longer, I had to flag down a different waiter to order dessert. Our desserts didn't take too long. 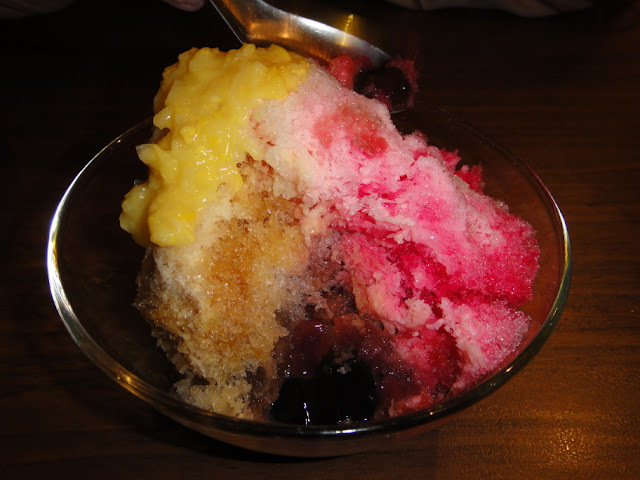 We had one of my favourite Malaysian desserts, the Ais Kacang, which was basically red beans, corn, grass jelly and rose syrup and sweetened milk over shaved ice. Admittedly not the best Ais Kacang I've had in my life, but not bad. The red beans were slightly mushy, but there was a good amount of rose syrup and they used the creamed corn that I prefer over the actual corn kernels. Nicely refreshing after all the curries. We were debating about whether or not to order a third roti because we were so full, but in the end decided hell, we're already here, might as well make pigs out of ourselves and get a sweet roti too. 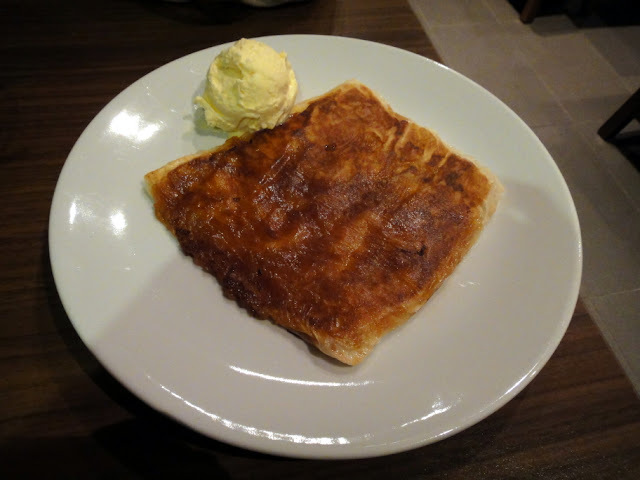 We got a Roti Kaya with ice cream. Kaya is a coconut jam, like a fruit spread, made from you've guessed it - coconut, flavoured with pandan and sugar. I had a bite of this as MerlinFan was telling me about her day at work yesterday. While she was rambling on, I began to tune out, suddenly immersed into my own world of OMG this is so good... until MerlinFan realised I was no longer paying attention to what she was saying. I grew up eating kaya till I was sick of it, but I'm by no means a kaya fanatic (aka anything with kaya will be amazeballs) but this was fantastic. Crisp, crunchy edges with the fluffy, slightly chewy centre containing a smear of sweet, creamy kaya. A match made in heaven. Mamak delivered simple yet delicious Malaysian hawker food, however service is a bit slow (though not unfriendly) during peak hours. Would I return? 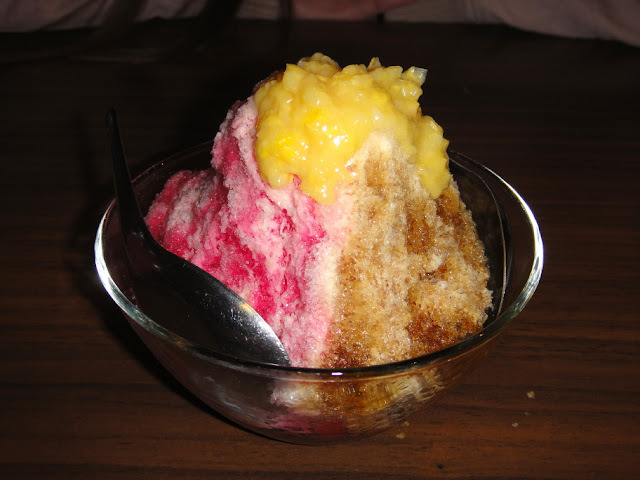 I would love to try the Roti pisang and Roti bom - and hell, that Roti kaya sure was a treasure.